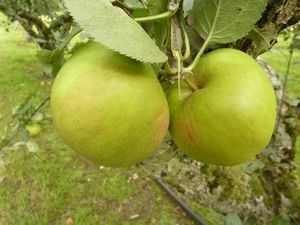 King's Acre Pippin - Apple Tree £12.75 - Dessert Apples - Late Season Apple Trees and Fruit Trees For Sale. Buy at competitive prices with wholesale discounts. 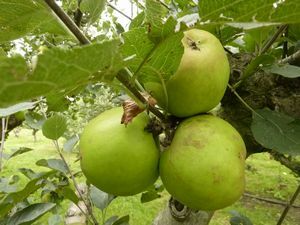 Kings Acre Nursery in Hereford introduced this fine apple in 1899. It arose as a cross between Sturmer Pippin a sweet sharp dessert apple and Ribston Pippin and aromatic dense fleshed cox type apple. Kings Acre Pippin combines the flavours and the keeping qualities of both of its parents. The yellow skin is flushed with red and has a sweet/sharp juicy aromatic crisp flesh, a beautiful apple in all respects that will keep until February.